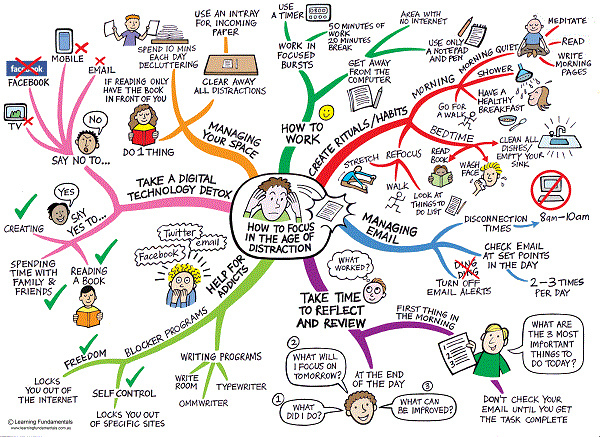 Digital distraction is becoming a bigger problem of the day. I wrote about smartphones increasing time taken to finish a meal in restaurants, the sad part such distractions is the reduction in family time. But then I make a living out of the same digital world! We seem to have lost the ability to simply be alone with our thoughts. Younger adults switch from task to task 27 times per hour – once every 2 minutes. Older adults switch from task to task 17 times per hour – once every 3 to 4 minutes. The more you switch between tasks, the more it hurts your performance. This is because you are not focusing on completing one task. Students today are unable to focus for over 3 to 4 minutes on an important task. People multi-task 25% of the time. They combine listening to music, watching TV, surfing websites, Facebook, WhatsApp. People check their smartphones every 15 minutes or less. 75% of young adults sleep with their smartphones nearby. Bad. People abandon websites if the time taken to download is over 400 milliseconds (less than 0.5 seconds), which was earlier 2 seconds, which was 4 seconds before that. We are getting impatient. Students own an average of 7 high-tech devices, of which they carry 3 to classrooms. You have a student with a Distracted Mind. Now coming to work, a study showed employees spent only half their workday on real “work episodes”. Most work episodes lasted 10 minutes in one stretch (average being 3 minutes). Email is the biggest culprit at work. People check their email once every 5 minutes (even when they are not expecting any email). WhatsApp & Facebook can’t be blamed for distractions but one has to blame themselves for checking for updates repeatedly [Pavlov’s Dog]. How do we fight this Distraction War? Being organized & focused is key to complete tasks. The ability to Single Task is almost dead. Keeping the smartphone a little away helps, keep all notification sounds off (no compromises on this one) and answer only phone calls. You can check your notifications once in an hour and open only the important ones. Thanks for my first boss in the US, way back in 1992 I underwent a few days of training by FranklinCovey. Those were the pre-smartphone days. It helped me get organized on an everyday basis. I use the same concepts in the digital world to stay organized (adding several reminders on phone). And it helps to use something like Freedom to stay focused.